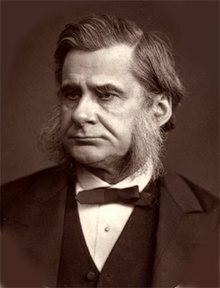 Bitheolaí a rugadh in Ealing Shasana ab ea Thomas Henry Huxley (4 Bealtaine 1825 – 29 Meitheamh 1895). An príomhthacadóir le smaointeoireacht Darwin. Chuir sé peirspictíocht antraipeolaíoch le cur chuige Darwin ar an éabhlóid ina leabhar cáiliúil Man's Place in Nature (Ionad an Duine sa Nádúr, 1863). Tugadh an leathanach seo cothrom le dáta an 24 Eanáir 2016 ag 04:56.